Anaconda facts bring the information about the snake which can swim well on the freshwater. The name anaconda is taken from Eunectes. This Latin name means a good swimmer. Many people also call it as a water boa because anaconda is included in boa family. Even though the animal is not venomous, it is large. It can eat the whole body of yours. They can be found living in South America and other tropical areas. Here are the complete facts about anaconda. The color of the body anaconda is greenish brown. It has a double row of black oval spots located on the back body. On the side body, you can see smaller white markings. There are several species of anaconda. Some of them are Eunectes notaeus, Eunectes murinus, Eunectes beniensis, and Eunectes deschauenseei. There are several names attached to anaconda based on the local name. The Native American people call it yakumama. 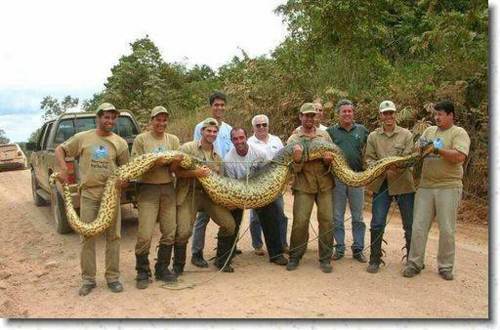 Anaconda is considered as one of the longest snakes in the world. It was the length about 12 to 16 feet. The weight of the animals is around 300 pounds. People can look at four types of anaconda. 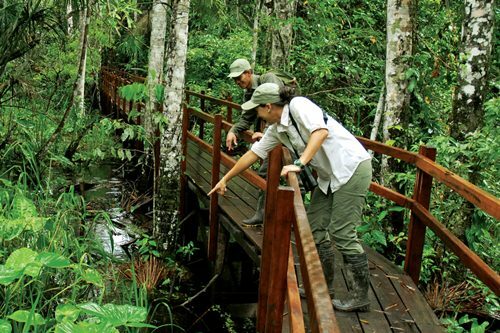 You can see yellow anaconda, Bolivian anaconda, green anaconda and dark spotted anaconda. Green anaconda is considered as the heaviest snake in the world. The length of this anaconda can reach 9 meters or 30 feet. The weight is around 227 kilograms or 550 pounds. Read rattlesnake facts here. Anaconda is not venomous. It kills the prey by squeezing until it experiences the internal bleeding. Anaconda will suffocate the body until the prey dies. Then the snake will swallow the whole body. The digestion inside the stomach is conducted with the enzymes. Seen snake facts here. There are some animals that anaconda likes to eat. They are turtles, ducks, caiman, deer, pigs, rats, mice, birds, fish, hamsters, and many more. In a day they will eat up to 40 pounds. 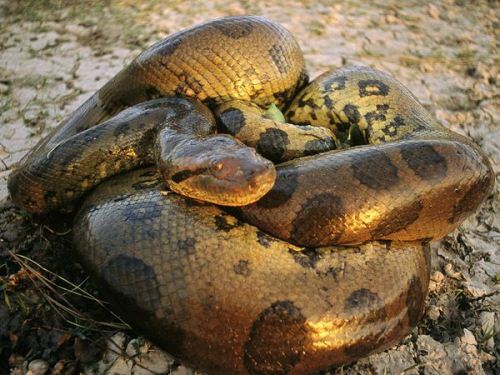 Even though anaconda can be seen living in fresh water all of the time, but sometimes they climb the tree in the forest. The animals can do it easily with the help of their small prehensile tail. 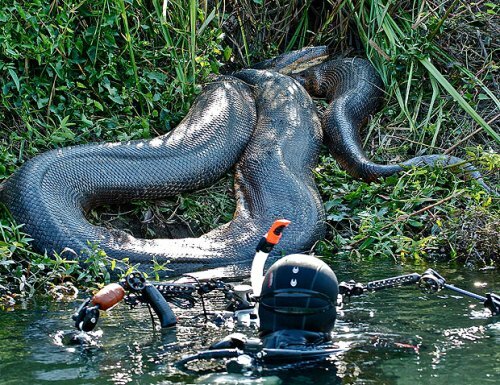 Anaconda will never move out of the water just to seek the prey. They like waiting for the prey to come to the back of the river. They will wait for bird and other animals. The male anaconda is smaller compared to the female anaconda. 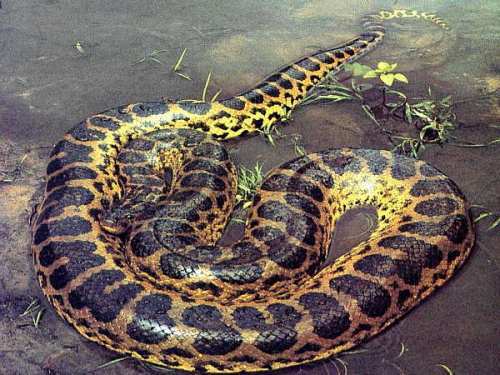 If you want to know the yellow anaconda, you can go to the southern part of Argentina. When it comes about the beauty of a snake, anaconda has the beautiful color. When the baby snake of anaconda was born it has the length around 2 feet. It can hunt and swim in the freshwater. Have you read all facts about anaconda?